Come and play, relax and refresh at Lake Leelanau’s Rustic Resort! This unique family resort has so many opportunities for every member of the family. We are located just 20 minutes from Traverse City on beautiful Lake Leelanau, just far enough from the city to miss the noise and traffic, but close enough to take in whatever activities you desire. We boast seven lake front “not so rustic” cottages and one lakeview duplex, each different in size and style, with accommodations for 6 to 15 people. Each cottage is individually owned and both the inside décor and outside landscaping reflect the owner’s tastes. 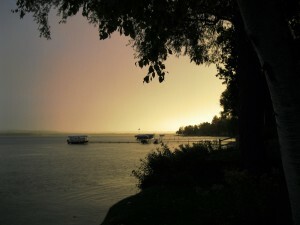 We share 450 feet of Lake Leelanau, with one long dock and individual spaces for boats. We are positioned on the “lee side” of the lake, in a protected cove. Our sandy lake bottom with a gradual slope, makes for great swimming. This is a perfect place to try kayaking or stand up boarding. Bring your boat or use the row boat provided with each cottage. Fishing on Lake Leelanau is legendary, but don’t ask the locals where to go!! Bring your fishing gear and try your luck for walleye, bass, and perch. We have a fish-cleaning station to get your catch ready for dinner. The little ones will love the huge sandbox and toys at lakeside. We also have space for outdoor games, volleyball and a small playground. Each cottage is fully equipped with all the necessary ingredients to make your vacation a memorable family time “Up North”. 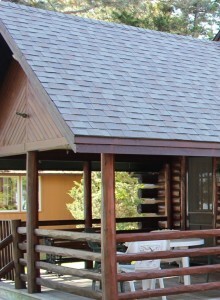 A deck facing the lake, picnic table, grill, deck chairs and rowboat are provided with each unit. You need only to bring your own bed and bath linens, as well as kitchen and beach towels. Please see the specific details of each cottage for more information.